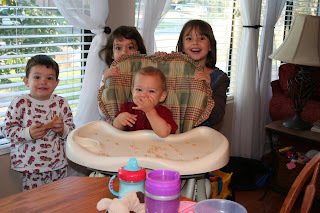 Kaleb was giggling and laughing so hard the other morning and I thought the kids were just making funny faces at him. I took a few pictures and only then discovered the true cause of his laughing. 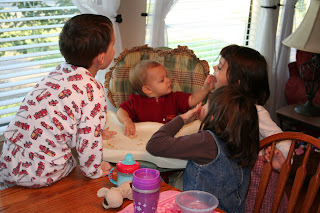 They were taking his breakfast (Cheerios), putting one on their tongue and then spitting them out. 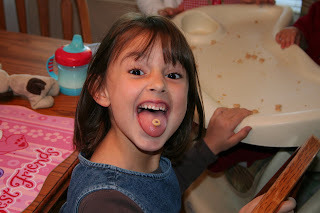 The Cheerios were flying everywhere. Over his head. Pinging him on his face. And he just laughed and laughed (which of course encouraged them on to do more). I just had to laugh (and sigh). But laugh. Especially as I realized he was still eating his breakfast, and could care less if the Cheerios were in someone's mouth or on the floor - or wherever. Your house sounds like a fun place to be!! !